After several days of patient cravings to go out for some baked ziti, Julia's sister Erica finally got her wish. Sort of. I offered to make her some homemade baked ziti for dinner. And with that, whether she knew it or not, came the possibility of all sorts of healthy twists that could have or could have not ruined the impetus for her hankering. Fortunately for her, there were only a few healthy tweaks, and from the ensuing hearty portions that were eaten by the whole family that night when it and arugula salad were served, I could hardly say it disappointed. Naturally the first place to start with baked ziti is well, ziti. Round tubular pasta. Of course I wanted fiber-rich, whole grain pasta so my choices were limited, and I grabbed penne, which is similar enough to ziti. I wanted Ronzoni pasta but my stupid grocery store was out of it, so I settled for the whole wheat pasta that actually looks like it is whole wheat. I knew this would be a strike against me with Erica, but I continued the mission. After boiling the pasta until finished al dente with a little kosher salt, I drained the pasta except for a tiny bit of pasta water and put the pasta back in the pot. I then added marinara sauce and nonfat Greek yogurt. I replaced the typical ricotta cheese with Greek yogurt and then lightened it further by using the nonfat variety. Also, by using a basic marinara/tomato sauce with no oil, it was a fat free combination for the penne's sauce. For reference, I used two bags of penne with one jar of marinara and about three quarters of a tub of Greek yogurt. The sauce came out pink and creamy and coated the pasta well. While the pasta had been cooking I had shaved one large ball of fresh mozzarella in my spiffy new electric food slicer from Julia. It was awesome since I was able to make nearly paper thin slices even with such a soft cheese as fresh mozzarella. I put a little less than half the pasta mixture into a nonfat sprayed glass baking dish and then a layer of fresh mozzarella slices. I added the rest of the pasta and sauce on top, just filling the dish, and then added a more generous layer of the shaved mozzarella slices on top. I sprinkled a little orange cheddar I had left over on top, for some color, and sprinkled a little salt and pepper to finish. I stuck the whole kit and caboodle in a 350 degree oven for 25 minutes at which point it was done perfect – crispy and golden on top, moist and gooey and flavorful beneath. So with the fresh mozzarella having less fat than many other cheeses, the pasta sauce being creamy despite having no fat, and the whole thing being made with whole wheat pasta, I can't say I did too poorly on the health aspect considering what baked ziti usually contains. 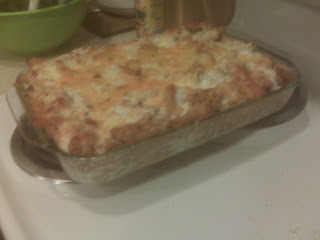 I call it ziti light, with all the same baked ziti goodness. And who could complain about that? No one – and that was the point.